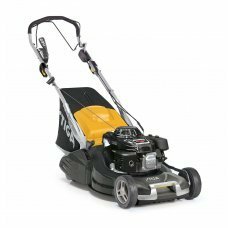 The Stiga Twinclip 55 S-R H BBC 53cm Self-Propelled Lawnmower is powered by a 163cc Honda GXV160 OHV engine with Blade Brake Clutch (BBC), providing plenty of power to deal with the toughest of conditions and a heavy duty aluminium cone clutch transmission. The Blade Brake Clutch allows you to empty the grassbag without stopping the engine. The Twinclip 55 S-R H BBC rear roller rotary lawnmower boasts new cutting technology – a double layered blade with 4 cutting faces. The leading edge of the blade makes the initial cut; the second blade cuts an additional 19mm, the cuttings are cut and re-cut through the blades as they are blown into the large 70 litre collector, resulting in a noticeable increase in collecting performance of around 20%. The cutting height is selected by a single lever on the chassis, with a choice of 8 positions ranging from 13 to 65mm that will produce a great finish on your lawn whatever the conditions. Cleaning after use is facilitated using a hose connection fitted to the chassis. The Twinclip 55 S-R H BBC is supported by a 5 year manufacturer's warranty. The 53cm/21" cutting width makes this great rear roller mower suitable for moderate size gardens up 50m x 50m.